I saw this idea at a grocery store. I thought my kids would have fun making these for our cooking class. They were super easy to make. We just added green gel food coloring to the sugar cookie dough and red gel food coloring to the frosting. 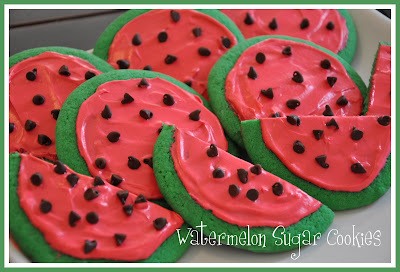 Then I let the kids sprinkle mini chocolate chips on top of the frosting to make the watermelon seeds. I always save leftover cookie dough for my kids to play with when we make sugar cookies. I always have a big mess to clean up but they love it. 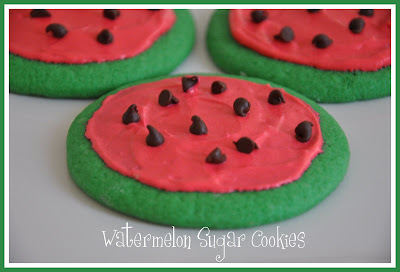 I think these cookies would be fun to make for a picnic. * To make these even easier you could buy a sugar cookie mix and canned frosting.